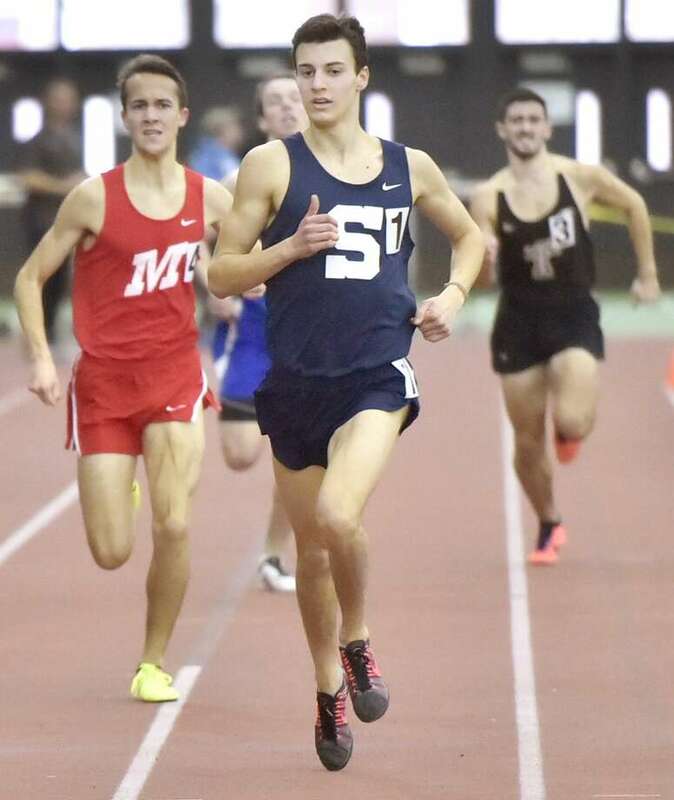 NEW HAVEN — The drive for five for the Danbury High School boys indoor track team was a rousing success Saturday as the Hatters literally ran off to capture the Class LL state championship at Hillhouse High’s Floyd Little Athletic Center. Everybody got to take a photo with the 2017-18 Class LL championship plaque, which will find a cozy home with the other Class LL plaques Danbury earned the previous four seasons. Danbury’s 4 x 400 relay winning time of 3:28.77 lowered their own LL mark by .17 seconds. Hamden was second with Ridgefield third. The victory gave Danbury a team total of 52 points to outdistance runnerup Staples (37), Ridgefield (32), Glastonbury (31) and Hamden (28). Going won the 600-meter crown in addition to running on two winning relays. Staples picked up most of its points in distance events and relays to earn the runner-up spot in the team race. The Danbury boys got off to a great start. Sean-Michael Parkinson, Going, Malachius Lorick and Glenroy Ford defended the Hatters crown and combined to win the 4 x 200 relay for the second straight year in 1:31.45. Hamden (1:35.32) was third. Xavier went wire-to-wire, lapping some of the field, to capture the 4 x 800 relay. The quartet of Will Curran, Trevor Christie, Pierre Sylvain and Owen Lally finished in 8:08.98. Fairfield Prep (8:12.96) was third with Staples (8:13.57) fourth. Chet Ellis of Staples captured the high jump by clearing 6-feet-4. McMahon’s Korey Morton was second on fewer misses at 6-feet-2. Newtown senior Zach Crebbin was third at 6-2. Staples senior Will Landowne powered through on the bell lap to win the 1,000 meters in 2:31.51. Ludlowe’s Ian Bartlett (2:323.93) was third. Tyler Rubush of Trumbull (2:33.43) was fourth. Landowne then accomplished the 1000-1,600 meter double. He won the 1,600 in 4:22.03 just edging Warde’s Alex Mocarski (4:22.88). Warde’s James Maniscalco was third. Going earned Danbury more points as he captured the 600 meters in 1:22.97. Xavier’s Pierre Sylvain (1:24.62) was second. Norwalk senior Katrell Clay captured the 55-meter hurdles in 8.04 seconds. Ridgefield’s Thomas Vilinskis (8.07) was second, with Newtown’s Brett Deri third. In the pole vault, Nathaniel Llanos of Danbury was third, Ridgefield’s Oliver Hayes was fourth with Westhill’s Josh Appel 5th, all clearing 13-feet-0. In the 55-meter dash, Hamden High sophomore Chris Pigatt was second in 6.59 seconds. Fairfield Prep senior Greg Anderson was fifth. In the shot put, Shelton High’s Ed Radzion repeated as LL champ with a heave of 48-feet-8.25. Kyle Woodring of Greenwich was fourth. In the 1,600 Sprint Medley relay, the Ridgefield quartet of Mitchell van der Noll, Francisco Turdera, Simon Jupp and Kevin Arnold won the event in 3:40.84. Greenwich (3:44.43) was second with Trumbull (3:45.27) third. In the long jump, Trumbull senior Jack Jones captured the title at 21-feet-9.5. McMahon’s Troy Bardos was fourth. In the 300, Danbury senior Sean-Michael Parkinson was second in 36.72. Hamden senior John Mayes (36.81) was third. In the 3,200, Fairfield Prep senior Drew Thompson won in a Class LL record time of 9:17.09. He broke the old mark of 9:25.77 set by Prep’s Christian Alvarado. Danbury’s Dan Nichols was third while Ben Seiple and Christian Myers were fifth and sixth for Staples.